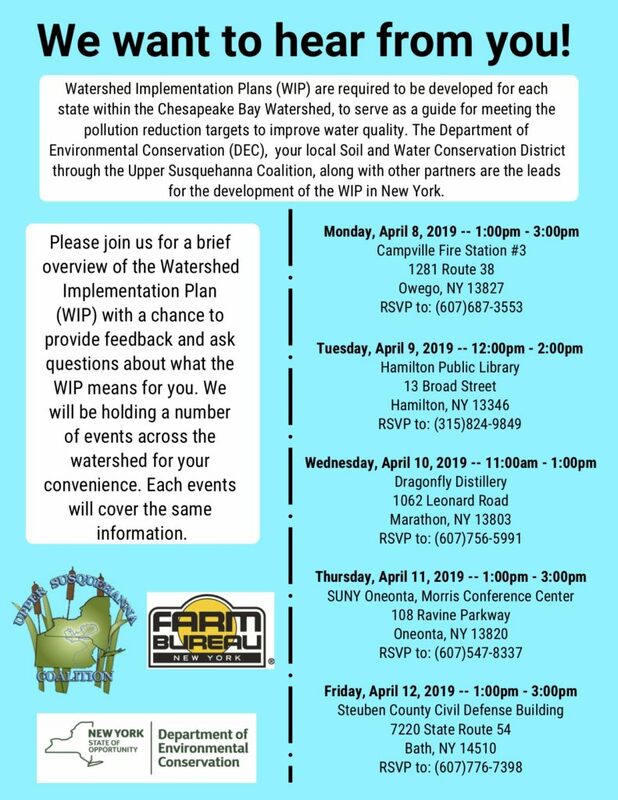 Chesapeake Bay Total Maximum Daily Load (TMDL) and Watershed Implementation Plans (WIPs) – what are these things, and what do they mean for you as a resident of New York State? The Upper Susquehanna Coalition is hosting a public event on Monday, April 8, 2019, from 1 to 3 p.m. where New York State’s Department of Environmental Conservation (DEC) will provide an overview of what this all means, as well as a time for you to provide feedback and ask questions. The Susquehanna River Watershed and the Chemung River Watershed form the headwaters to the Chesapeake Bay here in New York, with land area across 19 New York counties that eventually drains to the Chesapeake Bay in Maryland. The Total Maximum Daily Load (TMDL) is essentially the projected nutrient load that the Chesapeake Bay can receive from numerous nutrient sources and still attain water quality standards for dissolved oxygen and clarity. Those nutrient sources are broken up into five main source sectors: Agriculture, Wastewater, Urban, Forest and Septic. Each of these source sectors is assigned target nutrient reduction goals in the TMDL to meet by 2025. The Department of Environmental Conservation, your local Soil and Water Conservation District through the Upper Susquehanna Coalition, along with other partners are the lead on developing New York’s Watershed Implementation Plan (WIP). This document outlines how New York plans to meet the nutrient reduction goals in the TMDL for each source sector by 2025. While the Chesapeake Bay relies heavily on the agricultural community for a large portion of the nutrient load reductions for New York, everyone has a role to play in the Chesapeake Bay restoration efforts. 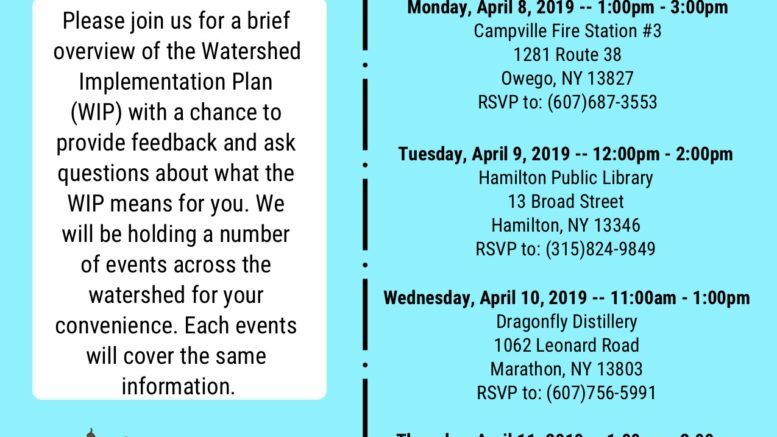 Join them for a brief overview of New York’s Watershed Implementation Plan on Monday, April 8, from 1 to 3 p.m. at the Campville Fire Station #3, 1281 Route 38, Owego, N.Y. Please RSVP to the Tioga County Soil and Water Conservation District by calling (607) 687-3553. Be the first to comment on "The Chesapeake Bay in New York"